With the exception of temporary rope or tape fences, this is the least expensive fence to buy. It's also simple to install/remove, visible, effective, attractive, and not affected by wind. Keeping animals away from hazards. Animal lanes from corrals to pastures. An interim fence until a more permanent fence can be selected, afforded and installed. The only difference is that 4.5 is smaller (4.5mm diameter vs. 6mm). Why? It has fewer plastic filaments. However, the metal filaments, conductivity and type of plastic resin are identical. PE 4.5 is easier to roll up and unroll. PE 4.5 is less expensive. PE 4.5 is less visible. Choice and size of rope. Number of strands of rope. Type of posts. Insulated steel and wood are more expensive but last longer. Choice of energizer. Solar units are the most $$. AC plug-ins are the least $$. The line post cost per ft and energizer cost per ft are similar for any number of strands. Insert T Posts at ends and corners. 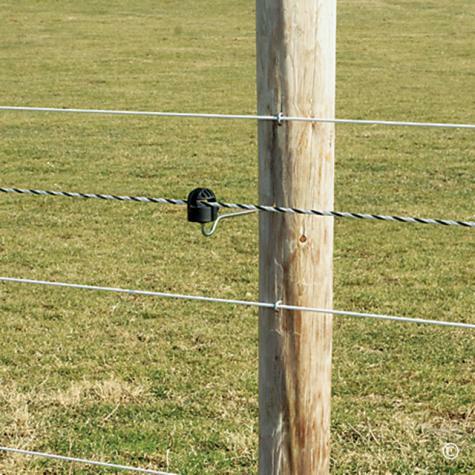 Line posts can be spaced up to 35' apart. Attach rope to the end post insulator with RopeLinks or Rope Connectors. 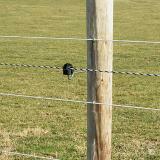 Walk along fence and attached rope to line post insulators as you walk, ending at last terminal insulator. Attach energizer. Turn it on. Check fence for voltage. You will need an energizer for this fence. Please refer to the Energizer section to determine your needs or refer to our energizer comparison chart. See additional installation instructions under "Diagram & Accessories" above. Use this safety cap to protect yourself, horses and jump-prone livestock from the jagged edges at the top of steel T posts.